From Stuff.co.nz by A. Paulin showing hail damage at an orchard near Motueka. 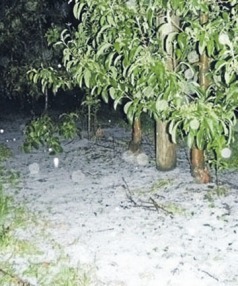 One of those living in the area, Ray Foxley of Motueka, had a hunch the hail storm was “weaponized” and was used to devastate the orchards deliberately. When asked why he thought this he replied that there were unnatural-looking cloud formations and aerosol trails apparent that day. Evidence shows that aerosol trails are primarily used for weather engineering purposes and typically comprised of aluminium, barium and strontium, amongst other toxins and biological components. Consequently, in order to get evidence to support his theory that the hail storm was an act of weather engineering, not a freak natural occurrence, Ray, a member of Chemtrails over NZ, placed a plastic container out in the hail on the night of November the 4th and collected a sample, which he videoed. Ray thought it was odd when the hail did not melt as it normally would – perhaps owing to chemical nucleation. “The hail still did not defrost until the next day,” he offerred. “I noticed the following day that hailstones still had not melted in some places when I drove down my road. I thought that that was strange, as we are getting into summer now.” Similarly, people in the US reported that some snow seemed to melt slowly. 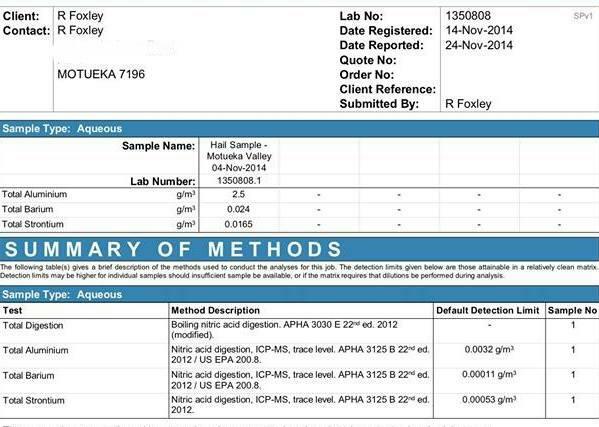 The hail sample was sent to R J Hill Laboratories Ltd of Christchurch, a trusted lab which is accredited by International Accreditation New Zealand. Ray asked them to test for aluminium, barium and strontium, which as mentioned are, evidence shows, the principal components of aerosols. He received the results on November the 24th and the lab confirmed the presence of all three heavy metals and found that the level of aluminium was particularly high. 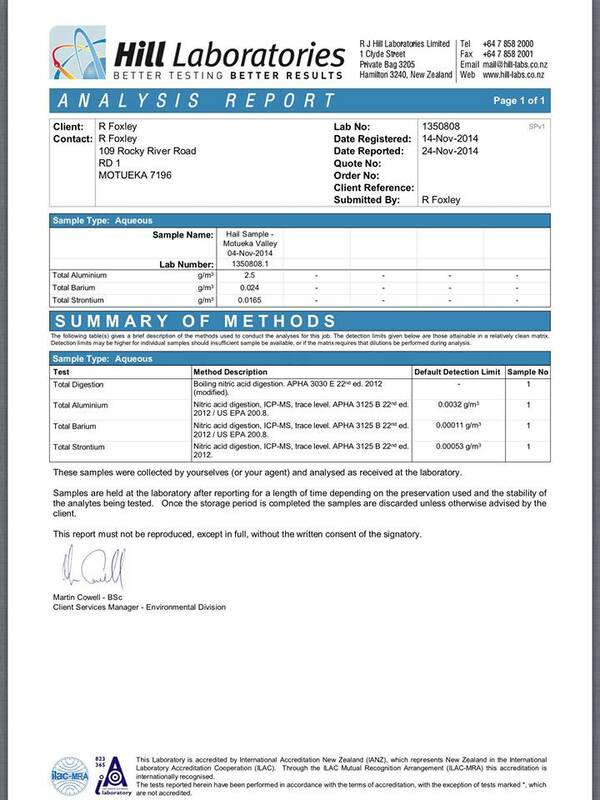 If you drink tank water, you must take note of these results and share them with your friends, as the concentration of aluminium in Ray’s hail sample was 2.5 grams/m³, which is equivalent to 2.5 milligrams/liter! (See the lab report below). The Guideline Value for aluminium in the Drinking Water Standards New Zealand 2005 (DWSNZ) (Revised 2008) is < 0.1 g/m³, which Ray’s hail sample exceeds by 25 times. Surprisingly, the Guideline Value relates to the water’s aesthetic quality, as it may not seem attractive to drink if there is too much aluminium in it. This is in spite of the fact that aluminium is known to be highly neurotoxic and linked to Alzheimer’s disease. Oddly there is no Maximum Acceptable Value referred to for aluminium in the DWSNZ. Some may wrongly assume that this means that high concentrations of aluminium are safe to drink, when evidence shows otherwise. For example, a study conducted by Trond Peder Flaten of the Department of Chemistry, Norwegian University of Science and Technology, Trondheim, Norway and titled: ‘Aluminium as a risk factor in Alzheimer’s disease’, (2001), looked at the epidemiological evidence linking aluminium and Alzheimer’s disease and found that 9 out of 13 published epidemiological studies of aluminium in drinking water and Alzheimer’s disease showed statistically significant positive relations. Barium, which is an immune-system suppressant, is a soft silvery metallic alkaline earth metal and it should not be found in rainwater, period. It is believed to being pumped into the atmosphere in aerosols sprayed from aircraft around the world, where it is being used for a variety of stealth warfare purposes in a silent war that is being waged against humanity. A clue to barium’s uses comes from Bernard Eastlund’s patent for HAARP. HAARP is a transmitter which can be used for a variety of functions, including heating the ionosphere. It has the ability to direct a steerable electromagnetic beam at the upper atmosphere and effect rainfall (and hail) patterns in a particular region and notably, the patent calls for large clouds of barium to be released into the atmosphere. Strontium may be being used in the form of strontium titanate, SrTiO3, as it is extremely reflective according to retired USDA Biologist, Frances Mangels, who has been studying the changes to his local environment in California caused by chemtrails/geoengineering. Finally, I will mention this again for new visitors, please beware of disinformation websites such as Metabunk, which try and pull the wool over an unsuspecting public’s eyes by advising that lab findings such as Ray’s are nothing to be concerned about. It certainly is not OK for aluminium to be present at a high concentration in the hail like this, just as it is not OK to find aerosol trails in the sky overhead day after day. As mentioned before on this website, we have found bright-white particles floating in the rainwater on a number of occasions, demonstrating that what we are finding is an industrial form of these chemicals, not a natural one and a whistleblower in the US has spoken out about aluminium oxide and barium being delivered to her airforce base. Lab Report from Hills lab in Christchurch. View the lab report in full at the link here. The patent for ‘Stratospheric Welsbach seeding for reduction of global warming’ states that aluminium oxide be used. Bernard Eastlund’s HAARP patent mentions that barium be put into the atmosphere. Why In The World Are They Spraying? A documentary. (2012). This entry was posted in Activism, Aluminium, Barium, Poisoning Environment, Strange Clouds, Weather Modification and tagged hail, hail storm, hailstones, Motueka, Nelson. Bookmark the permalink. Good on Ray for getting samples tested. I can’t say it was a surprise to see that crap found in the hail. The air is saturated in the crap. I, myself have done 3 tests, one collection here in Timaru, the other, I collected from snow and the 3rd I did whilst in Brisbane, Australia. Wasn’t it Henry Kissinger who said: “Who controls the food supply controls the people; who controls the energy can control whole continents; who controls money can control the world”? South Canterbury Sky Watch, can you share the results of your tests? Not so long ago, i did ANOTHER test and surprise surprise, the same crap but eerie thing was the Barium was higher. I dont think they are showing up on Clares sight but might have to get them up. Good work. I saw the chembomb from where I was in Richmond. The skies were a mess of unnatural-looking clouds and I’m not surprised in the list that this test came back so high in aluminium. Barium and strontium should also not be present in our rainwater, but are very essential for HAARP to work. I believe there are different aerosols for different affects. This one was high in aluminium, perhaps to cause large peices of ice to fall and maximize the damage? And now lithium is also in the rainwater, after Ray Foxley got a retest for this substance. Lithium is highly conductive, it is used a lot in making batteries, electric cars and for ‘treating’ mental illness as a drug for schizophrenia as an example. ‘They’ are making out too that there is a world shortage of the mineral. It should not be present at all in rainwater. I have written to the Department of the Environment on this matter, and I would like to contact Ray Foxley directly. Can anyone supply his email address? I have advised Ray that you wish to contact him and sent him your email address Clive. Thank-you for your interest and thanks for getting in contact with government regarding this matter. Have you had any response from the Minister? Not that I am aware of Candy. I hope someone in Nelson has done another rain or HAIL test. Just seen on the News…. the News that FAILS to speak the truth about chemtrails, geoengineering or what ever other name there is, but my god, the farmers must be at their wits ends. CROPS DESTROYED, ONCE AGAIN. FOOD SCARCITY, PUMP UP THE PRICES, ROB YOUR WALLET. Question is, was this storm a manufactured storm or was it just natural????? With so much foreign material being sprayed in the skies, so many freaky looking lines in the sky above, makes one wonder what the hell is going on.